On 2nd January 1932 the Thames Fire Brigade made a spectacular save, that prevented the major destruction of the shops north of Court's Corner, that had previously been destroyed in 1876. The Auckland Star has full reports of the fire on 2nd January 1932 and information on insurance costs 6th January 1932.
BUSINESS BLOCK ABLAZE SAVED BY BRIGADE. CHURCH ENDANGERED. STOCKS DAMAGED BY WATER. (By Telegraph.—Own Correspondent.) THAMES, this day. A fire broke out at 1.5 this morning in a two-storey block of wooden shops in Pollen Street, adjacent to Mary Street corner. It originated in the premises of Mr. Charles Bunting, electrician, and extended to the shop of Mr. William Carson, bookseller, a portion of Court and Sons' drapery premises, and the shop of She Chong, a Chinese fruiterer, and that of Mr. Henry Lowe, butcher. All were old buildings, having replaced premises which were destroyed by a big fire in 1876. The above photo looks at the section of shops, looking north. Thames shops are wonderful for identification as they all liked to build different roof lines and facades, their architecture to this day helps make location identification so much easier! 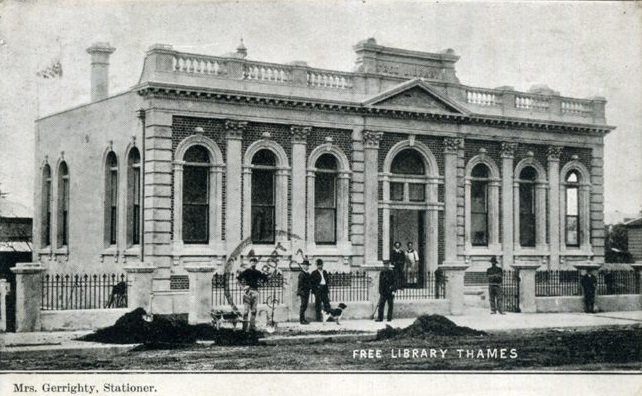 If you have any early photos of Thames businesses in particular, I would love to hear from you, so that they can be added to The Thames Business Registers that are held at The Treasury, Thames. 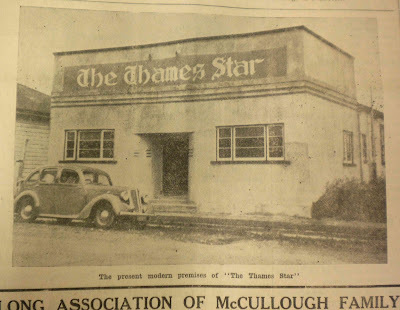 We need your help to identify more old Thames businesses. 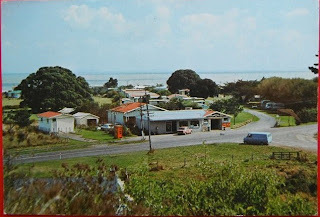 The Annual General Meeting of the Thames Coromandel Heritage Trust is being held at The Treasury on Queen Street, Thames next Saturday - 31 August 2013 at 2pm. 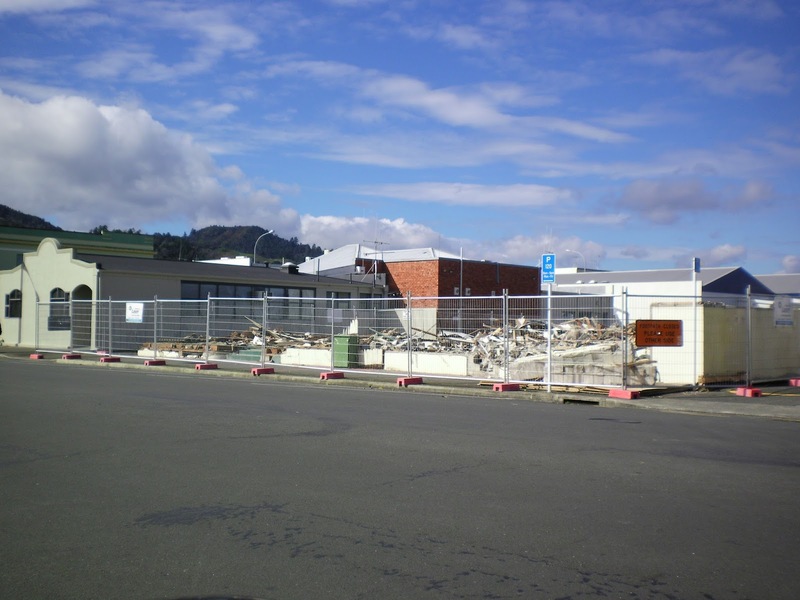 The Guest Speaker will be Morrie Dunwoodie, who will update everyone on the Treasury Archive building. The next months and years to come will be exciting times. Come along and hear more, plus how you can help - every bit helps. Times change and businesses have different needs and requirements. An icon of Thames was the old Thames Star Offices. These had been extended to the west and south over past years, but as of 17th August 2013 they no longer are standing. The next months will see a new building being erected. 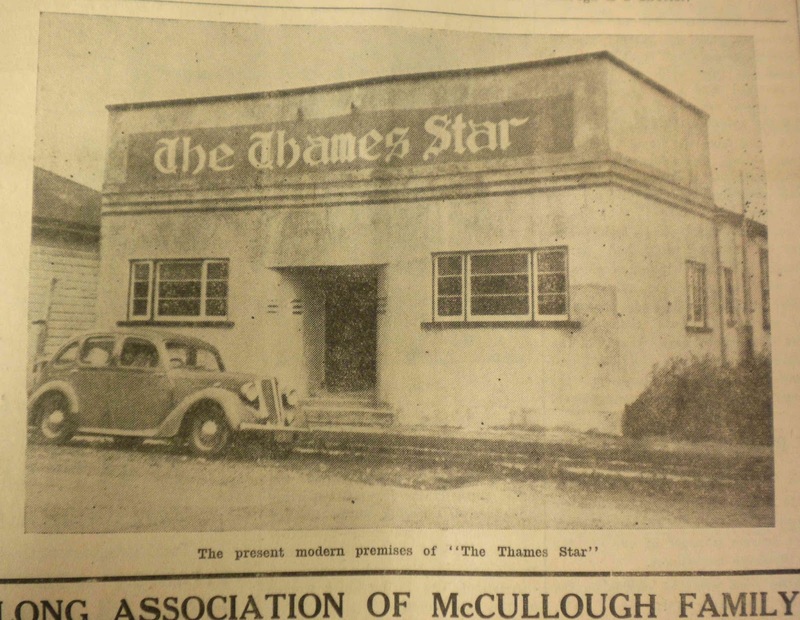 Saturday, April 10, 1869 - the first copies of the Thames Star were printed from an office in Brown Street, Grahamstown. Known then as the EVENING STAR. Premises were next moved to Albert Street and then in 1927 to the building used by the Thames High School Engineering Department. In 1938 the paper then moved to the Sealey Street location. 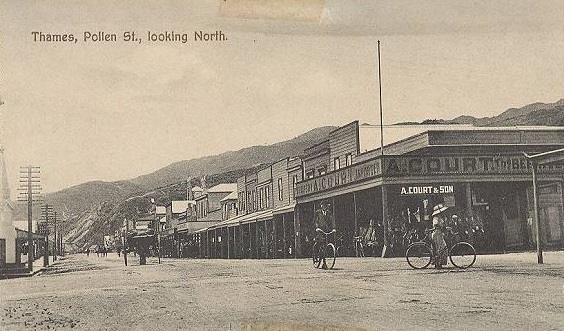 Although later to become part of the Hauraki Herald and cease publication, the premises have carried on to be used to publish the Hauraki Herald. 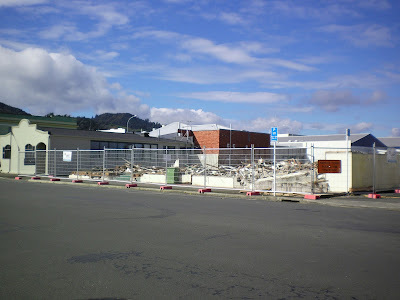 The Hauraki Herald/Publishers offices are shown below - the shell of the old building to the left and hidden under a front façade. 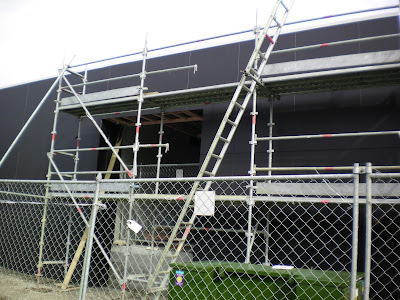 Above: The Hauraki Herald Offices July 2013. Further information on the old Thames Newspaper businesses is available at The Treasury, Thames. A report in the local paper 10th November 1899, has details of a Sport's Day held at Dodd's Paddock Parawai. Races all sorts and distances were held and their was full participation - including visitors from Auckland and other areas. 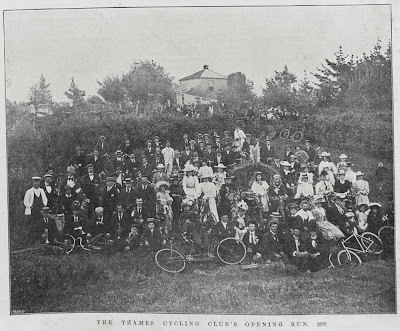 The Thames Cycling Club held their spring meeting at Dodd's Paddock yesterday afternoon under most favorable circumstances. 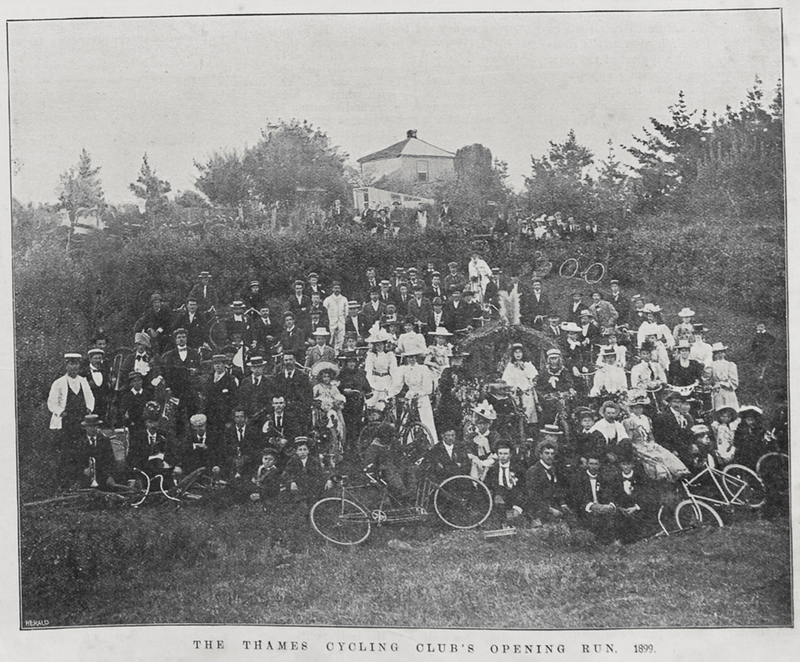 The day was an ideal one, and the attendance was a record one for the Club. This was to some extent due to the large number of excursionists that arrived from Auckland and Up-country. We are quite safe in saying that the gathering was by far the most successful yet held under the auspices of the club, while from a sporting point of view the meeting was very good one, the finishes in the 'majority: of the races being very evenly contested. The cycle track was in splendid condition in fact, it could hardly have been in better order. During the afternoon, the Hauraki Brass Band, under Bandmaster E. Williams, played quite a number of selections in their best style, and the music was greatly appreciated. The following were the officials of the Club, and they are certainly deserving of credit for the highly successful manner in which they carried out the arduous duties undertaken by them —Judges: Messrs H. J. Greenslade, J. Jordan, and W. Woodward. Starter and Referee; E, Nordon. Handicapper, Mr W. B. Eyre; Marksmen J Messrs A. Buckland, H. Koefoed, and W. Constant. Call Steward: Mr F, Ladner. Number Steward: Mr W. Syms. Time keepers: Messrs. H. J. Fielder, E. Jones, and A. S. White. Hon Secretary: Mr W. J. Irwin. 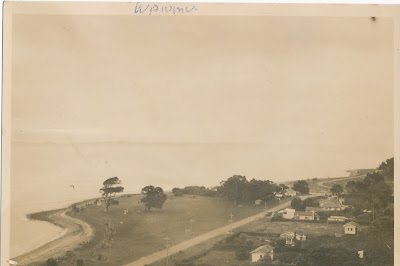 It may seem strange to younger readers today, that the people of Thames would often travel to Te Puru or or Waiomu for their holidays. To get even that far was an adventure! Maybe the entrepid holidaymakers went by bus, or service car (taxi); few would have been lucky enough to have their own car. 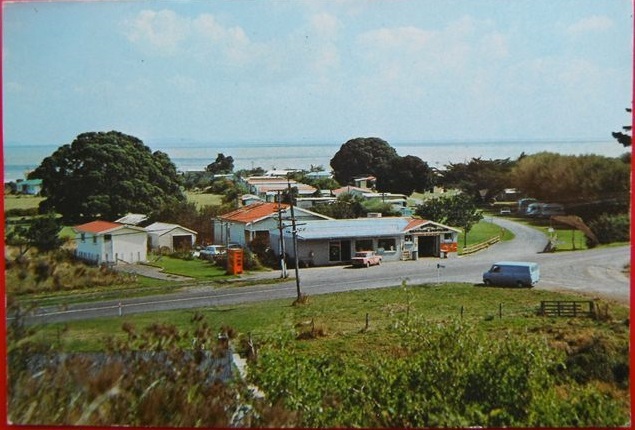 Many would have then camped on the open reserve areas, yet undeveloped with the housing as we know it today. An account from 1945 reads: There are more holiday-makers at Thames coast resorts than for several previous years. Roads to the beaches have seen an almost continuous procession of campers over the last few days. The most popular of the areas near Thames is Lower Puru, and Waiomo has greatly increased in popularity. Sites at these places are well occupied. 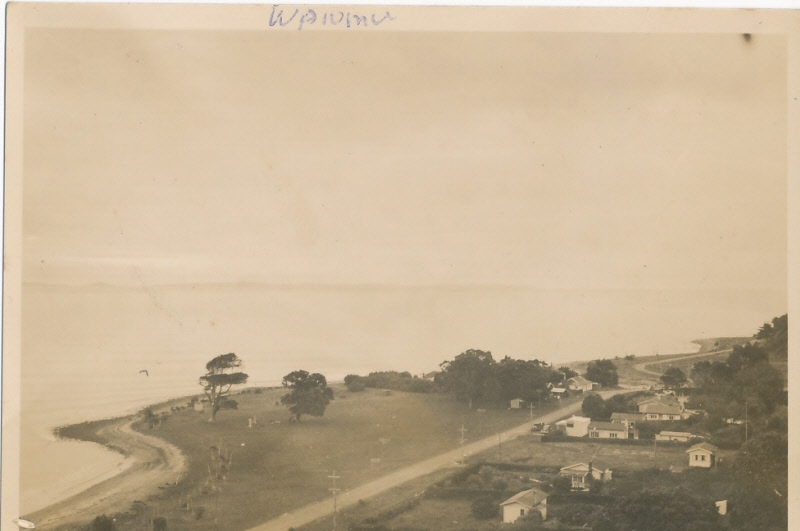 Tapu and Thornton's Bay also have a good number of holidaymakers, who to date have had ideal summer weather, although until today the sea has been rough. Added numbers are at Waiomo this year because of the opening of the summer camp of the Y.M.C.A., Hamilton, which will last for six weeks accommodating 150 boys in each of three periods of a fortnight. (Auckland Star 28th December 1944) The war was drawing to a close, but rationing would still have been in place. While staying down the coast, fishing played a big part in feeding the hungry holiday-makers and bringing hours of pleasure. 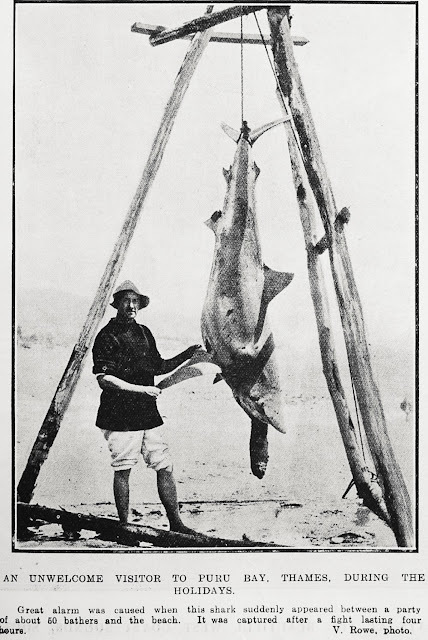 Fish was plentiful and boat loads of snapper were a common occurrence - even the larger shark was bought ashore for display. 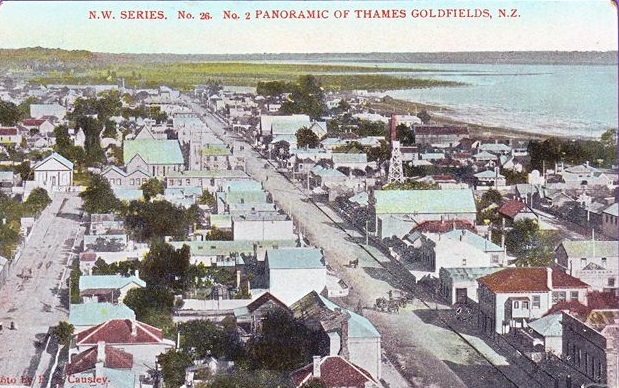 For those researchers wanting information on goldmines of the Thames Goldfields, the first port of call is usually the Thames School of Mines and The Treasury. There are detailed maps of mine location and information on production, directors and shareholders. Along with in many cases, photographs of old workings. With the help of the GeneaMap webpages, it is now possible to view the location of some of the major goldmines that were centred around the main confines of the townships of Shortland and Grahamstown (Thames). Start at the GeneaMap entry page, unclick all the icons on the far left - except for the gold mining icon (Crossed pick-axes), put THAMES in the top left search box. Now press SEARCH. The display will now look like the image below. You can now use the scroll on your mouse to zoom in to look closer, also click on the screen to drag the map to different views. You can click on the different location icons to view possible photos/info and a link back to The Treasury. Special thanks to Murray and Dave for developing this new resource for Thames. Search The Treasury Index for possible mining entries, for indexed resources. Previous posts have mentioned aspect of the hospital and nursing history. Also that a photographic history is available. 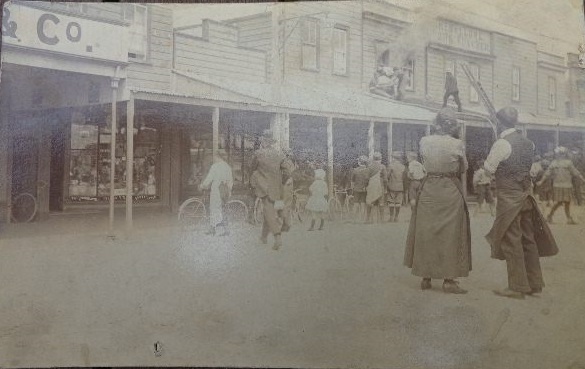 The old photographs that adorn the eastern end of the long corridor (off Mackay Street), are always a delight to peruse. Especially the 'Nurses World War One' Plaque. 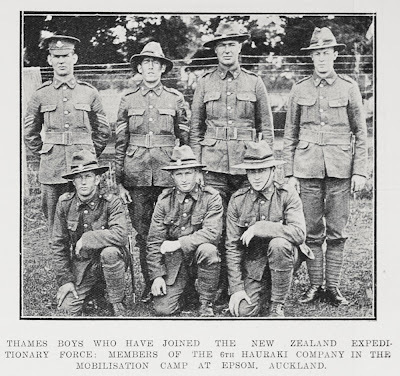 (Mentioned in the journal article on WWI at The Treasury Journal). 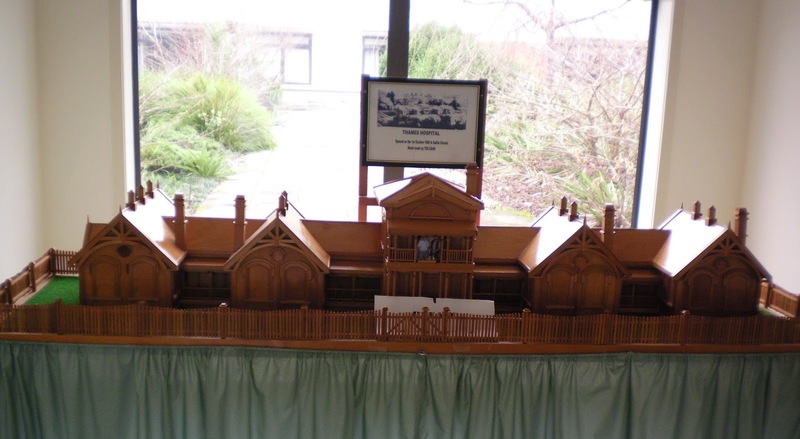 There is also a wooden model (Built by Mr T Egan), of the 'old' hospital on Baillie Street, which was the street that was closed to allow for hospital campus redevelopment in the late 1940-50s. 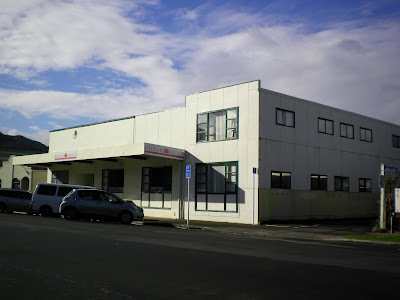 The hospital had its official opening on 1 October 1900 and consisted of: main block, operating theatre, four wings for wards and several out buildings. Accommodation was for 50 patients. 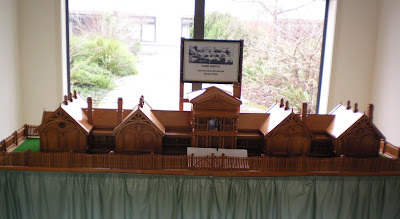 The first hospital building was opened in 1868, often referred to as the Goldfields or Thames Goldfields Hospital - built primarily to care for the miners and their work related accidents. War files make interesting reading for the family researcher and historian alike. World War One and Boer War records for Thamesites, can be found via the ARCHWAY SITE. A growing number are digitised and can be downloaded for viewing or printing. 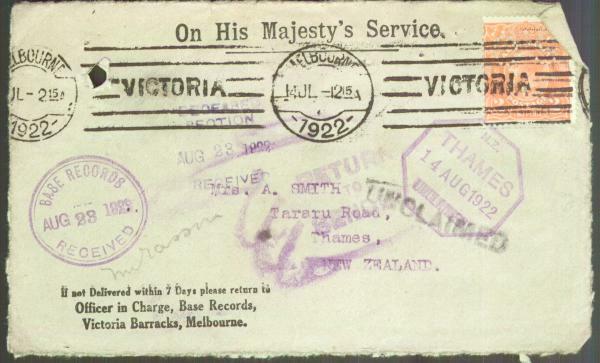 Today I have found many Thames boys who also served in the Australian Armed Forces and their files can be viewed online. A compilation of this war information can be found at The Treasury in Thames. The information in the war file varies. Examples seen today contain letters of hardship from descendants, requests for full details of a loved ones death. You also find full biographical details on the Attestation form and physical description on the medical examination records. Amazing the number of men who were between 5 foot 4 and 5 foot 6 inches!! Some news sent from the war office was undelivered. 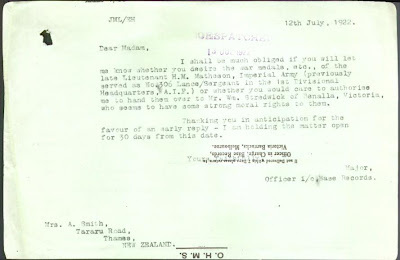 A relative of HARRY MACKAY MATHESON was for instance sent a letter regarding medals. 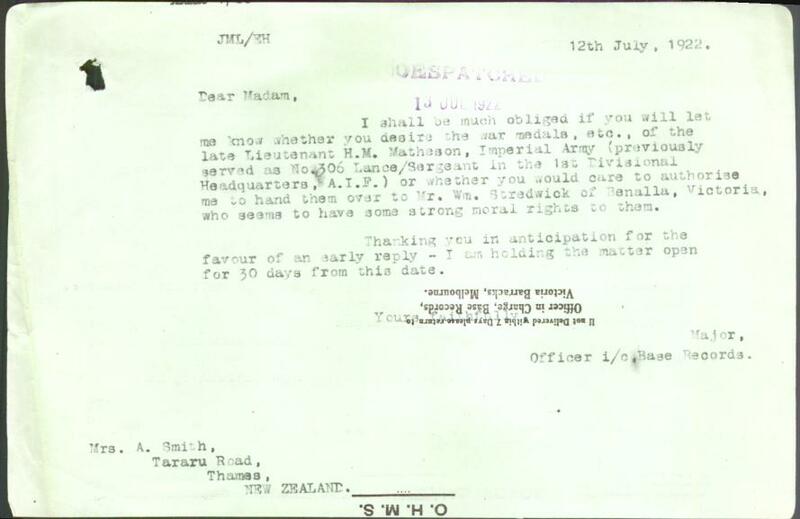 The letter went to Mrs A SMITH of Tararu. It makes you wonder how many families lived in fear of receiving a telegram or letter from the War Department. HAVE YOU ANY WAR LETTERS related to the wider Thames Area? Would you be able to contribute a copy to the Treasury Archives? 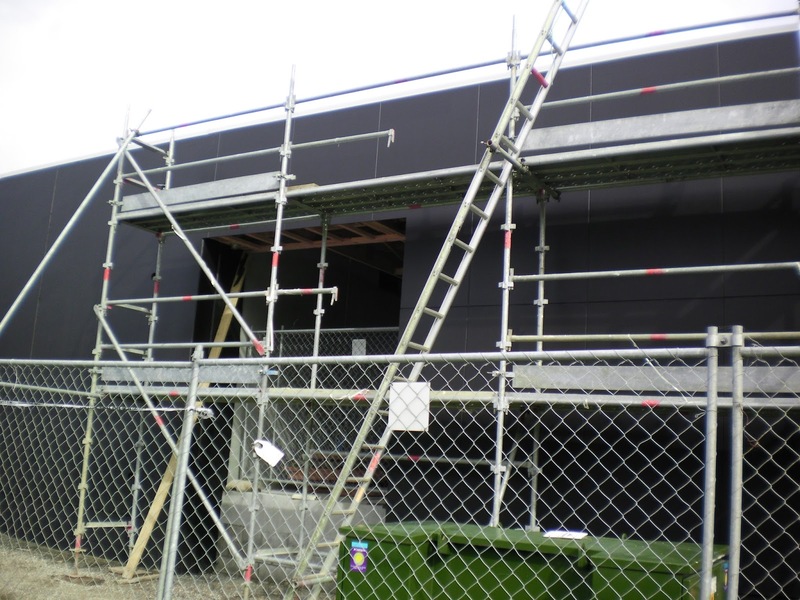 Yes the outside walls are now a charcoal black and awaiting the external cladding. Keep a lookout for the next photo - the effect is guaranteed to be very dramatic and stunning. With the commemorations for World War One starting in 1914, it is timely to ask whether anyone has any family who served and were from the Thames area. The Treasury has a webpage with details of those who died and served. At the Treasury in Thames, an on-going project aims to gather further names and resources. Have you any memorabilia, photos, letters, diaries that could help tell us more about the men and women who served in World War One. If your answer is yes, contact me (email to right) or contact the Treasury direct via the contact page. The summary of the project can be seen here.